Commercial Wind Insurance Options for Garden Centers | The Voss Law Firm, P.C. ?What should I do if my business has been damaged by wind? ?What can my business do if the insurance company refuses to pay for our losses after a windstorm? ?What can I do to make sure my business property is covered for losses in a windstorm? From small independent growers to industrial greenhouse operations, garden centers provide the food and vegetation needed to sustain our lives. The green industry is made up of over 250,000 businesses and generates over $150 billion every year, and each owner’s livelihood lives or dies along with the plants he sells. For this reason, it is vital that owners select the proper insurance that will allow them to weather Texas storms. Attorney Bill Voss explores specific coverage needs among green industry owners, helping businesses big and small recover from wind damage. Standard property damage coverage for growers and retailers should include all structures, utilities, and stock that can be damaged or lost due to a wind storm. Of course, there may be exceptions and limitations on wind damage coverage that can limit the amount of your payout. Greenhouses. Greenhouse growers have a greater amount of control over temperature and climate than outdoor growers, and can supply customers with out-of-season fruits and vegetables, ornamental flowers, hothouse plants, and tropical trees. Insurance policies should include everything necessary to maintain a controlled growing environment, including fans, water supply, heating systems, and other specialized equipment. 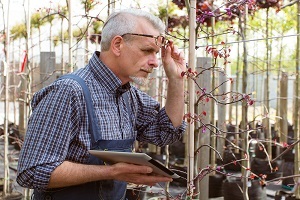 Owners may need to have their greenhouses and equipment assessed to determine a proper valuation of coverage. Since many large orders may be held offsite while awaiting delivery, owners may wish to purchase coverage to cover losses of greenhouse crops and stock held for sale. Nursery growing. Operations that involve the growing of plants and trees in open fields are significantly more exposed to wind damage than those in greenhouses. Insurance policies should include wind and hail damage coverage for stock in the open, which may only be covered on a special form basis. Owners should also consider coverage for business inventory in transit, protection for stock held in a consignment facility awaiting shipment, and coverage for lost business income due to damaged crops or an inability to plant a new crop cycle. Retail garden centers. These major clients of the greenhouse and nursery growers are typically focused on selling flowers, trees, and plants to customers, and may offer gardening treatments, tools, and supplies as well. Greenhouse structures at these locations are typically only intended to house plants ready for sale, although some garden centers do have small-scale growing operations. These centers should be protected from interruptions in the supply chain due to weather, as well as coverage for losses to their own stock after a wind storm. Landscaping operations. Garden centers may offer major or minor landscaping services, which will require separate or enhanced insurance coverage to cover business auto losses and general liability. If you are struggling to collect fair payment from an insurer after a wind storm, we can help. Simply fill out the form on this page today to contact the Voss Law Firm or order a free copy of our book, Commercial Property Owners Must Read This BEFORE Filing an Insurance Claim.